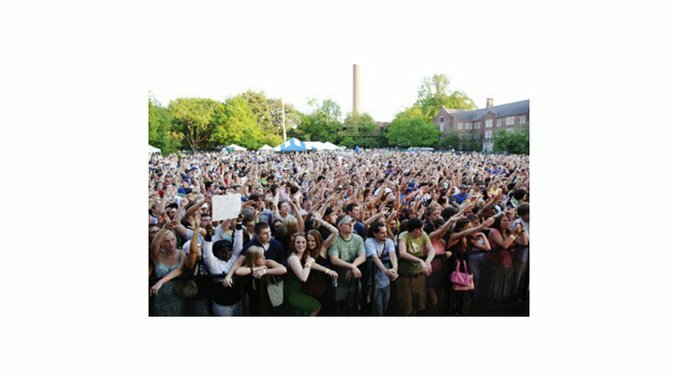 For over 30 years, Vanderbilt University’s annual Rites of Spring music festival has brought hope to sonically starved independent- and alternative-music enthusiasts trapped in a city known internationally for its glossed-up mainstream country music. Held on Vanderbilt’s Alumni Lawn, Rites of Spring features local, up-and-coming and major-label artists. In the past, Rites has brought artists like Talib Kweli, Gomez and Phoenix, and this year—while the fest was condensed from three days to two because of budget constraints—the lineup was one of its strongest ever with the likes of Ben Folds, Cary Brothers, My Morning Jacket, Matt Pond PA, Bone Thugs-N-Harmony, Ben Lee, Secret Machines and Clap Your Hands Say Yeah. Clap Your Hands, a five-piece from Brooklyn, was one of last year’s most acclaimed indie bands. Its self-titled, self-released debut, a remarkably strong record (#5 on Paste’s best albums of 2005 list), features playful synth-pop melodies, witty lyrics and an overwhelming youthful energy. Unfortunately, CYHSY’s Friday-night Rites of Spring performance didn’t capture the grassroots quirkiness of the band’s studio material. On the album, “Skin of my Yellow Country Teeth” features lead vocalist Alec Ounsworth furiously crooning in a flat falsetto, but lyrics such as “Once the dogs have quit their barking / Son, my neighbor said to me / Know the emptiness of talking blue the same old sheep” were even harder to comprehend live. The band seemed disconnected and disinterested, and the subtleties that have made CYHSY one of the most unique and intriguing bands in recent memory were lost in white noise and Ounsworth’s misguided garbling. Chalk it up to inexperience. Hometown favorite Ben Folds headlined Saturday night’s lineup, primarily drawing from his two solo albums, Rockin’ The Suburbs and Songs for Silverman. But the crowd erupted when Folds launched into “Army,” one of his more popular songs from his days fronting the ironically monikered Ben Folds Five (the group consisted of only three members).